As the temperatures begin to drop, we’re moving into soup weather. Today’s secret recipe will show you how to make Applebee’s French onion soup. Loads of caramelized onions in a rich beef broth with melted Provolone cheese. I like to make large batches of this soup and freeze it. In a large stockpot over medium heat, first heat the butter and oil, then add the sliced onions and salt; saute the onions until they are browned. This will take up to 30 minutes; you want the onions to have the color of caramels. When the Onions are almost fully caramelized, add the chopped garlic. Cook the onion and garlic together until the garlic has become fragrant, about 2 minutes. Add beef broth, beef base, and black pepper. Taste and add more salt if needed. Simmer for 30 to 45 minutes over low heat. To serve soup, preheat the oven to broil. Ladle soup into 8 individual ovenproof bowls, place a slice of bread on top of each, add top each slice with 1 teaspoon Parmesan cheese, and provolone cheese. Place under the broiler and cook until the cheese just begins to brown. Today I have a secret recipe for a popular appetizer served at Applebee’s. 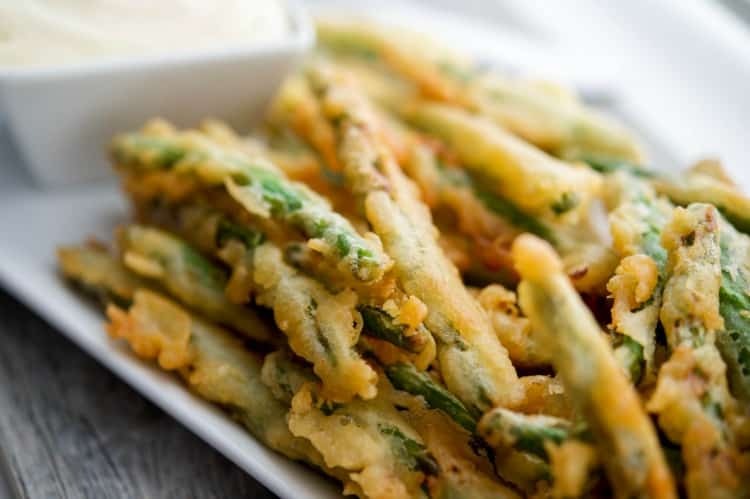 Fresh green beans are battered and fried to a golden crisp and served with a lemon garlic aoli dipping sauce. What’s not to love? For a healthier version you can try making this dish in your air fryer. Preheat it to 400 degrees F and cook for in single layers for 8 to 10 minutes. Heat the oil over medium-high heat in a large sauté pan. You can also use a deep fryer if you have one. Combine the flour and beer in a large bowl and mix well; removing the lumps. Add the green beans to the batter and coat. Working in batches, place the green beans in the hot oil shaking off any excess batter before placing them into the pan. Cook 2-4 minutes then drain on paper towels; repeat for the remaining green beans. Today I have a secret recipe for a healthy and flavorful dish served at Applebee’s. 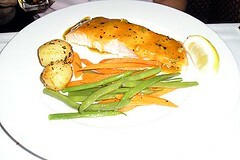 Fresh salmon fillets are grilled to perfection and then brushed with a sweet and savory honey-pepper sauce. Depending on how spicy you like your food you can add more or less cayenne pepper to the sauce. Make the sauce by combining all ingredients in a medium saucepan over medium/low heat. Stir occasionally until sauce begins to boil, then simmer uncovered for 15 minutes or until syrupy. Watch the sauce closely to be sure it doesn’t bubble over. Rub each salmon filet with olive oil, then add a light sprinkling of salt and pepper. Grill the salmon for 3-4 minutes per side or until done. Alternately, you can bake these at 375 degrees for twelve minutes if you prefer not to grill them. Once your salmon is cooked, remove the salmon from the grill or pull from the oven, and brush each fillet with the honey pepper sauce. Serve the fish with small ramekins of additional sauce for extra dipping. Today I have a secret recipe for a tasty new dish served at Applebee’s. This sweet and savory take on the comfort food, four-cheese mac & cheese is topped with crispy breaded chicken tenders tossed in a honey pepper sauce and topped with bacon. What’s not to love about this dish?